If this card is Normal Summoned, its original ATK becomes 1000. (Quick Effect): You can Tribute 1 DARK monster; reveal 3 Normal Traps from your Deck, your opponent randomly picks 1 for you to Set to y.. Your opponent cannot Tribute this card, also they cannot target it with card effects. You can only use each of the following effects of "Darkest Diabolos, Lord of the Lair" once per turn. 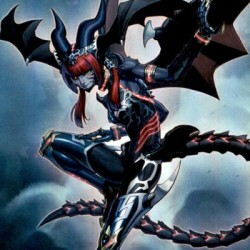 :- If a DARK..
You can discard this card; add 1 "Lair of Darkness" from your Deck to your hand. You can Tribute 1 DARK monster; draw 1 card, but if you Tributed a DARK monster other than this card, you can add 1 DAR..
You can Tribute any number of DARK monsters; Special Summon this card from your hand, and if you do, it gains 500 ATK for each Tributed monster. If this card is Normal or Special Summoned: You can tar..
You can Normal Summon this card without Tributing, but its original ATK/DEF become halved. If Summoned this way, it is destroyed during the End Phase. You cannot Special Summon any monsters, except Fi..
You can Tribute Summon this card by Tributing 1 Tribute Summoned monster. If this card is Tribute Summoned: Target 1 card on the field; banish it, and if you do, inflict 1000 damage to your opponent, .. Cannot be Normal Summoned/Set. Must be Special Summoned (from your hand) by Tributing all monsters you control. This card's ATK becomes the combined original ATK of the Tributed monsters. If this card..
Once per turn during the End Phase, If this card attacked this turn: Destroy this card. When this card on the field is destroyed and sent to the GY: You can Tribute 1 monster; Special Summon this card.. If this card on the field is destroyed by a card effect and sent to the GY: You can target 1 "Archfiend" monster in your GY, except "Archfiend Cavalry"; Special Summon it, but it cannot attack this tu.. If this card destroys a monster by battle and sends it to the GY: Inflict damage to your opponent equal to the original Level of that monster in the GY x 100. You can banish this card from your GY; Sp.. Your opponent takes no battle damage from attacks involving this card. Once per turn: You can target 1 Effect Monster in your GY; banish that target, and if you do, until the End Phase, this card's na..
Fiend-Type monsters you control, except "Fiendish Rhino Warrior", cannot be destroyed by battle or card effects. If this card is sent to the GY: You can send 1 Fiend-Type monster from your Deck to the..
During the End Phase, if this card was Normal Summoned this turn: You can Tribute this card; excavate the top 5 cards of your Deck, you can add 1 excavated Spell/Trap to your hand, also send the remai..
During your opponent's turn (Quick Effect): You can banish this card from the GY; excavate the top card of your Deck, and if it is a Normal Trap Card, Set it to your side of the field. Otherwise, send..
All face-up monsters on the field become DARK. Once per turn, if you would Tribute a monstern you control to activate a card effect, you can Tribute 1 DARK monster your opponent controls, even though ..